Water is an important factor in cave formation. It finds its way through cracks, dissolves, and melts, creating caves all over the world. There are many different types of caves, but caves made out of limestone rock are the largest. Limestone caves form when acidic rainwater leaks through the cracks of a rock. Over time, these cracks become wider and wider. The trickles of water then develop into streams, which hollow the ground even further. Eventually, these hollow areas become large caves. Water also can create rock formations. Over thousands of years, minerals deposited by dripping water form stalactites and stalagmites. A stalactite is a mineral deposit hanging from a cave roof that is shaped like an icicle. 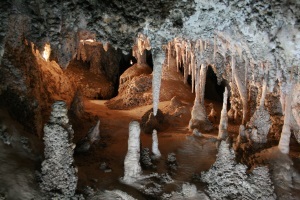 A stalagmite is also a mineral deposit, but it is cone shaped and found only on the cave floor. Trickling water is not the only thing that makes caves, though. A cave can also be made by waves when they hit cliff-like structure. As the sea cliff disintegrates from the water pressure, it eventually forms a cave. Ice caves form when a stream of melted water runs beneath a glacier to form a tunnel. Volcanic caves form when the top layer of lava hardens and the rest of the lava flows away. There are many types of caves you could visit. But if you want to see the longest cave in the world visit Mammoth Cave in Kentucky, which is about 350 miles long.